After spending two years working in the Middle East, Rosie and her husband moved back to London with their 18-month-old twin boys and began looking for a family home. The couple wanted to live in south-west London in the catchment area of a good school. ‘This house was perfect: it was in a great location, had four bedrooms, and every room had been painted cream so it was easy to move in and live here as it was,’ recalls Rosie. Partway through 2014, the couple got finance in place for an L-shaped extension. They needed to apply for planning permission as the work fell outside permitted development, and asked an architect to draw up their ideas into firm plans. The couple submitted their application in October 2014 and the following month they had consent. By now, Rosie had been talking to builders and had selected Nick Jepp, from Elevation, because of his helpful attitude and fair price. Nick agreed to begin the work the following spring, and Rosie couldn’t wait to get going, putting together her ideas with a focus on creating a light, warm kitchen, flexible enough for entertaining grown-ups and children alike. Rosie drew the kitchen layout herself, thinking about the ergonomics of the design. To complete the work, builder Nick recommended local kitchen firm Blok Designs, who quoted around £25,000 for the project. Work on the kitchen began as planned in April 2015. 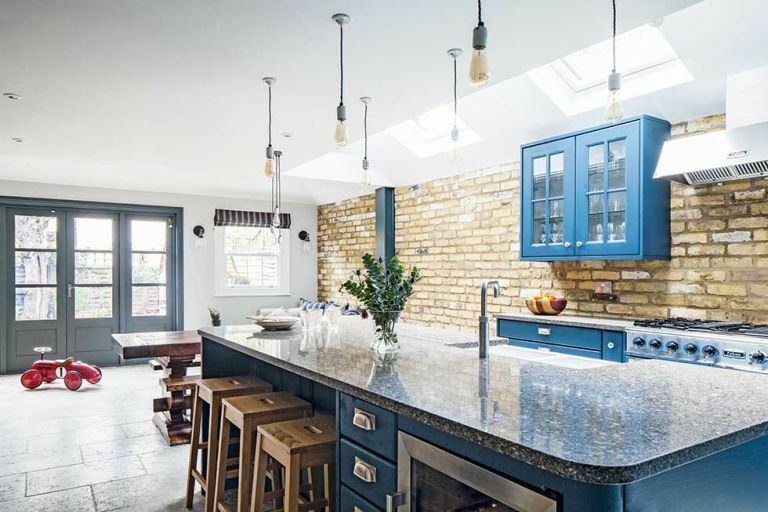 Find out what they did next, then check out more real home transformations and find out more about extending a house in our guide. Rosie and son Patrick in the extended kitchen, where Shaker-style units from Blok Design, painted in Farrow & Ball’s Stiffkey Blue, contrast with treasured antiques, including the table and bench. The London yellow stock brick wall was left exposed to emulate the old chimney breast. The roof pitch along the side-return extension has been raised up, creating light and space above the run of units below. Rosie made a feature of one of the steel supports by painting it in Farrow & Ball’s Down Pipe, which matches the French doors, from Reddish Windows. Rosie’s bay-fronted terraced house was in the ideal location and offered scope to create a spacious family kitchen by replacing a cold conservatory at the rear and extending into the side return. The driving force behind the kitchen style became the heritage blue Rosie had set her heart on. ‘It isn’t just the colour, it’s the aesthetic,’ she says. The quartz worktop has drainage grooves cut into it around the double Belfast sink from Caple. The full feature appears in the May 2016 issue of Real Homes. For back issues subscribe today to take advantage of our money-saving subscription offers.